Day One — The ultimate journaling app. iA Writer Pro — An opinionated app that takes the “minimalist text editor” concept to a whole new level, yet still offers unique, powerful features that set it apart from the pack. 1Writer — Similar to Byword, just with a different aesthetic. I’m probably missing some, and this isn’t even counting apps like Drafts, Simplenote, Vesper, and Evernote, which are ostensibly for notetaking but work just as well for general writing. A built-in, multi-tab web browser. This is so handy when I’m in the research and link-gathering phase. The browser includes 1Password support. I’ve found that I actually use the Editorial browser more often than I do Safari, so this is a real lifesaver. A completely customizable preview pane, which accepts HTML and CSS code. This means I can preview exactly what my _Spark Journal_ articles will look like right there in Editorial; no need to create a web draft first. It even lets you create multiple preview themes, so you could, for instance, create light and dark themes for day use vs. night use. Last but certainly not least: The ability to create some pretty advanced workflows, which I’ll get to in a bit. * Markdown support — Like many writers on the web, I write in Markdown syntax. Now, I realize you don’t need a special editor to write Markdown — that’s sort of the point — but being able to preview the HTML output of my documents before publishing is key. Bonus points if the text editor highlights Markdown syntax in-line so I don’t even have to switch to a preview pane to know that my syntax is correct. TextExpander integration — I don’t know what I would do without my TextExpander snippets. I suppose I could always rely on the keyboard shortcut feauture built into iOS, but TextExpander is a vastly superior experience and I’d hate to go without it. Universal compatibility — A fancy way of saying I want there to be both an iPad and an iPhone version of the app. I find this creates a far more seamless experience. Document sync — Whether it’s with iCloud or Dropbox, I like knowing that my documents are being backed up to the cloud where I can access them from any device. Without these features, I just wouldn’t feel at home in any writing app. Editorial doesn’t just meet these criteria — it exceeds them in ways no other text editor has yet been able to. Notice that “minimalist writing environment” isn’t part of the list. It can certainly be a nice feature, but I’ll take Editorial’s “power user” features over additional blank space on my screen any day. There was a time when the following list would have been much longer. Admittedly, I do still have a ton of workflows saved in Editorial as I write this, which I should do something about. Many of them are now collecting dust, since (a) I’ve found a certain groove in my writing process where I don’t need as much automation as I used to, and (b) Editorial continues to add native features that copy (or improve upon!) functionality that previously could only be accomplished with workflows. One such feature is the ability to rearrange paragraphs via drag-and-drop, added in the version 1.2 update. Read further on The Sweet Setup for the whole article and workflows. Lately there was some discussion referring to Markdown extensions. The use of .md was in favor of normalization Markdown extensions, instead of using .mdown, .markdown, .text, .txt or otherwise. 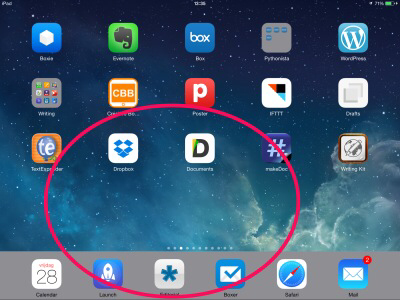 (Dropbox/Apps/Editorial/), a two-way synchronization. Very convenient. I use Documents from Readdle as my file management system and Documents can also enable two-way sync with Dropbox (Dropbox/Apps/Editorial/). If you use .txt as a Markdown extension, you can edit the files in Documents, even if there is no internet connection. 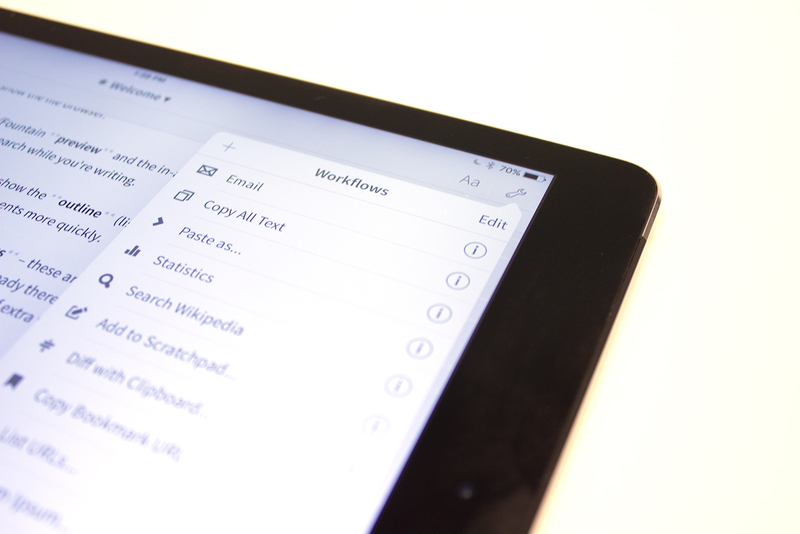 You don't have to download your file manually to your iPad. With .txt Documents do that automatically for you. After the internet connection has been restored, Documents will sync with Dropbox and Dropbox will sync with Editorial. Very handy indeed.